Many of our images of Martin Luther King Jr. are those of him walking, arms locked with others in solidarity, toward equality with hundreds of people behind him. Such a scene was repeated again today as the nation celebrated the holiday honoring King. Supporters of historically black colleges marched in the streets of Jackson, Miss. hoping to take steps to stop Mississippi Gov. Haley Barbour's plan to consolidate state-supported black colleges and university, as reported by the Jackson Free Press. among many measures to trim the state's budget by $411 million. But many fear that merging the schools will erase the history and identity of institutions founded to educate emancipated slaves and their descendants. The consolidation of Mississippi's black colleges and universities is a ove that some fear could usher in the extinction of those institutions. African-Americans have already seen the strong tradition of black boarding schools, which were feeder schools to black colleges, fade away. The preservation of each and every black college is critical to both the intellectual survival of black people and the nation. Black colleges and universities have given many of us a chance at higher education when others would barely glance at our college applications. Average students are given a chance to experience college and thrive at black schools. At black colleges ordinary students may enter but extraordinary people graduate from those schools. Historically black colleges are not breeding grounds for underachievers. The academic intensity is as strong as any other school. I know. I've attended both a historically black university and a mainstream one. The standards at black universities are high because the faculty and staff there know that the stakes are high for black students. Being black and undereducated today is not a choice. Instructors at historically black colleges push students to succeed in a way that is profound. Whether it is the distinguished professors with doctorate degrees who challenge black students in the classroom or the custodians and kitchen staff who nourish and encourage students outside the class, the black college campus is a special place where students bloom. 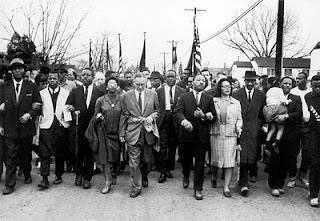 It is fitting that supporters of historically black colleges took to the streets on the King holiday. King himself was a product of a historically black institution, Morehouse College in Atlanta. Sadly, this is a fight that isn't new and neither are marches to save them. As a student organizer at Jackson State University in 1994 I worked with others to organize a massive rally to protest the consolidation of historically black schools. The Ayers desegregation case ignited the fire in us to move to the streets. Then- NAACP head Benjamin Chavis marched with us and current NAACP President Benjamin Jealous was among the student organizers. At a recent alumni meeting in Columbus, Ohio my classmate and friend Alesha Russey and I looked back on those days with pride. We thought our fight to preserve our schools was over until Haley Barbour revived it. But the battle to preserve Mississippi's historically black colleges and universities is ongoing. King advocated for equality in all areas in American life including education. Unfortunately, more than 40 years after his death we are still marching to maintain the institutions that have educated when no one else would. But this is a fight that we shall also overcome some day. With the high cost of a college education, no one wants to pay more than they must. Yet thousands of families pay too much for college every year because they don't understand the basics of financial aid and don't know the right questions to ask. So let's learn what questions to ask. Education plays important role for the prosperity of country ,it is necessary for every person related to every walk of life ,through education a country can make progress ,government should make school for the education of students and osteopath Canberra as well for the health related concerns of the children because when they play, they get injured and need someone to take care of them. King day is really amazing day and event for us because in this way the people can enjoy their life. I am sure that the people will feel very good. I hope that the people will get a lot of best essays in our life.